Free: Two Art Sewing Workshops at Pelham Art Center! Pelham Art Center is pleased to offer the public two free Sewing Workshops led by Brooklyn fabric installation artist Amanda Browder onSept. 20, 2014 from 2-7PM and Oct. 26, 2014 from 1-6PM. 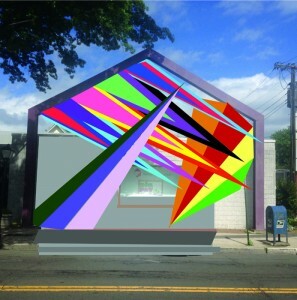 The collective sewing project will be part of a large-scale fabric installation whose giant colorful triangle shapes will play off the front of the Pelham Art Center’s 26 ft. iconic steel arch, and contrasting with its solid rectangular architecture. The public sewing workshops are open to individuals of all ages who will share in the construction of Triumvirate!,the multi-colored site-specific fabric installation that will hang on the arch of the Pelham Art Center, in Pelham, NY. Children under 10 should be accompanied by an adult. Artist Amanda Browder and the Pelham Art Center are asking the public for donations of colorful fabrics for the installation. Donations to the “Fabric Bank” can be dropped off 10AM-5PM M-F and Saturdays 10AM-4PM between Sept. 2 and Oct. 26, 2014. We ask the community to look through their closets for non-stretchy colorful fabrics such as patterns and solids in reds, oranges, and yellows. Clothing such as colorful pants and bright colored cotton shirts (no T-shirts, please!) are a great source for the “fabric bank” as well. During each workshop participants of all abilities will trim and cut material into specific shapes, pin pieces together to construct large triangles and sew pieces together. Sewing machines and hand sewing tools will be provided. The sewing will be easy, and instruction and assistance will be available. Children, who will mostly hand sew, will be amazed how productive they can be in a short time. The second Sewing Day Workshop will focus on finishing sewing and preparing the piece for installation. Triumvirate! isa multi-colored site-specific fabric installation that will hang on the facade of the Pelham Art Center, in Pelham NY. Using donated fabrics from Pelham and the surrounding areas, Triumvirate! will be a visual statement that buildings are not separate from the democratic life and spirit of the community. Born in Missoula, Montana in 1976, Amanda Browder received an MFA/MA from the University of Wisconsin at Madison and taught at the School of the Art Institute of Chicago. She currently lives and works in Brooklyn, New York producing large-scale fabric installations for building exteriors and other public sites. She has shown on three continents including at the Nuit Blanche Public Art Festival/LEITMOTIF in Toronto; FAB Fest, New York City; The Dumbo Arts Festival, Brooklyn; Mobinale, Prague; Allegra LaViola Gallery, NYC; Nakaochiai Gallery, Tokyo; White Columns, NYC; No Longer Empty, Brooklyn. Photos and reviews have appeared in print media from the New York Times to Fibers Magazine and she is a founder of, and can be heard on, the art podcast, www.badatsports.com. The artist website is www.amandabrowder.com. This entry was posted in Press Releases and tagged fabric, free, pelham art center, public art, sewing, textiles, westchester art center, workshop. Bookmark the permalink.